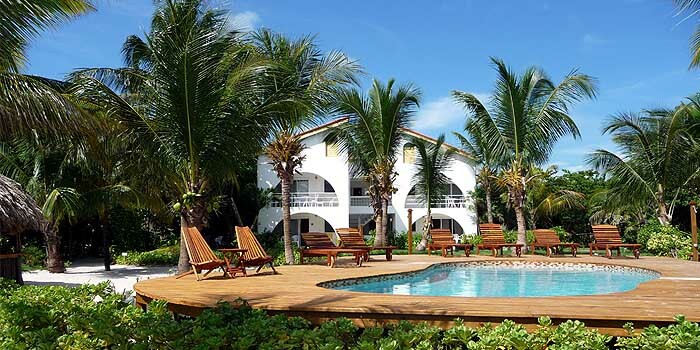 Caribbean Villas Hotel "Our Belize Vacation" - "Our Belize Vacation"
Whether you are looking for a romantic wedding, honeymoon, anniversary or just a getaway from the crowds, a spell of renewal or a stepping stone to adventure, we can cater for your needs. Only twelve rooms in 2.5 acres of landscaped gardens, fronted by 250 feet of private beach and hiding the only bird sanctuary and people perch on the island. Caribbean Villas has been designed with conservation in mind. The bird sanctuary is one of the few remaining areas of original littoral forest, unchanged from the times the buccaneers buried their treasure here. The water heating is supplemented by roof top solar panels. Irrigation is from rainwater catchment tanks. The rooms are designed to catch the cooling trade winds to reduce the need for air conditioning. Stay with us and be at peace with nature. There is a 300 foot private dock from which you can snorkel over our artificial reef, lie in a hammock or catch your tour boat to adventure. The tour boats will pick you up from the dock to take you snorkeling, diving, manatee watching, cave tubing, visit Mayan ruins or to one of the many romantic waterside restaurants situated along the shore. Tours, golf cart rental and bicycle rental can be booked in advance or at the front desk after you arrive. Golf carts are restricted on the island so we recommend you book in advance. The Villas are sufficiently far from town to preserve your peace and quiet but a 10 minute barefoot walk along the beach will take you to San Pedro with its cobblestone streets, quaint shops and many restaurants. As you’ll see in these pages, there is much to do both on and off Ambergris Caye, but at Caribbean Villas you can also just relax. Don’t forget to do nothing. You won’t find it listed in the Tours section, but one of the best trips you can take at Caribbean Villas begins and ends in a huge hammock right on your own beach . 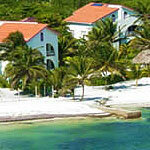 . .
Caribbean Villas offers some of the finest accommodations on Ambergris Caye. All units are ocean front, enjoying a beautiful view of the Caribbean.All units have ceiling fans and air-conditioning. For more family accommodation, some units can be joined using connecting doors. Each air-conditioned room has a queen size bed, private bath with shower, small sofa and dining room table with chairs. Attached is a covered veranda for relaxing and enjoying the gorgeous Caribbean views. (Maximum 2 Guests). All spacious two level suites include, mahogany cathedral style ceilings and woodwork, air-conditioning in master bedroom, ceiling fans, option for conversion of king size bed into two twins, cable television, large refrigerator/freezer, stove, coffee maker, blender, toaster, dinnerware, and utensils, 20' wide covered veranda with seating to enjoy the gorgeous Caribbean views. Our garden studio has two twin beds, private bath with shower and a sitting room/kitchen area. A ceiling fan and louvered windows complete with air-conditioning. (Maximum 2 Guests). Small refrigerator/freezer, microwave, coffee maker, blender, toaster, cable television.